Master filmmakers the Coen brothers, of course, made a film out of this. Halfway through you realize just how close they get to the book itself, to the point where you almost wonder, why?? Thing is this book is pretty great, the use of language tying brutality to the history of the land, and forces at play somehow over and through it all that are impossible to comprehend, and simple American folks in the midst of it, while being an exciting tale through it all that keeps your attention, and keeps you engrossed in its atmosphere. If you’re familiar with the Coen bros films, you can understand how these themes would draw them to this material. But if a work is so well realized, what’s the point of doing it again? In the end though, I think the movie and the film both compliment each other. The novelist and the filmmakers do not have the exact same vision, but they build off of one another’s, enhancing both. Where McCarthy scopes in on brutality, the Coen brothers focus more on absurdity. Still, absurdity and brutality loom large in both the book and the film (they just switch lead roles). I address the film because it’s interesting, but also because it is most likely most people’s context for the book at this point. With all that said, the book by itself is rich, engrossing and powerful. 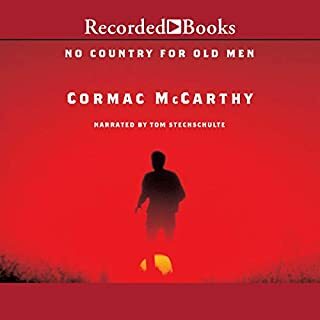 It proves to be a good entry into the worlds of Cormac McCarthy. I’ve begun both The Road and Blood Meridian, but didn’t get too far in either. Now, after this book, when I have a better understanding of what he’s doing in joining characters to a landscape, I am much more inclined to give those books another go round. Everyone approaching this book anywhere near the time it was released is a part of this story. That is, you have your own story, and if at all you ever paid any attention to the news, or even just absorbed it by living, you experienced the moments portrayed in this book. More so,you reacted to them. As blips in news media. Not as stories as much as a succession of framed events, actions merged with a sprawl of opinions and emotional reactions. And then another framed event welded with words and words about the event. Myself, I remember where I was, when Obama was elected. When gay marriage was made law. When Obama didn't order strikes on Syria. And for damn sure I know where I was the day after the 2016 election. I was throwing up, sick as a dog from stress. Had to call in sick. But that's me. I don't know about you. So I, and you, know this story. That is our lives have happened with it in the backdrop. But do we know the story? Are the reports of what happened, followed by a war of words between "sides" to take control of how all of us perceive and thus respond to said events, are they any kind of real story, about real humans? Or are they more just a string of emotional reactions, where the key players cease to be real people, but something more like stand ins for ideas, that we either do or don't like, something verging more upon the lines of a terrifying fiction? I continue to follow the news, as if I had a choice, all the actions and reactions before we all collectively move on to the next event and it's talking points. In all of it, I have no choice but to react to it, then and there. No big picture, no full story, just shocks and responses. And then, here does come a story, a full one, about the Obama years, written by one of Obama's closest aides, who happens to be a very good writer. 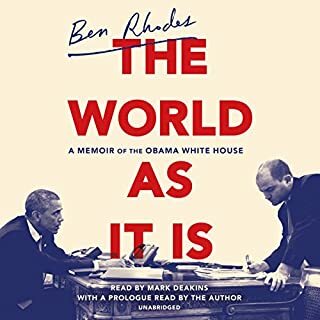 The book is not an analysis of 'what happened,' it does not tell us how to think about the events portrayed, it is but the recollections of one man's life, while serving in the White House, one man's human story of the work he did for eight years, and it becomes a portrait of the vision and the focus of that work, and of the man from whom the direction of that vision came: it becomes a much appreciated, human portrait of Obama himself. Obama dancing with another aide in the back of a car to Thrift Shop by Maclemore, with the secret service in the front seats, the author wondering what they must think of it all. Obama joking with his staff, being the first to call after the author's first child was born, saying "The kid looks like you. Let's hope she ends up looking more like your wife Ann." Then adding, "your life will never be the same." Obama being short with his staff sometimes, the weight of the world almost literally upon his shoulders. And Obama, after Trump was elected, saying, "maybe we were wrong. Maybe people just want to be a part of their tribes." That last one is quite a statement. I do not hold to every aspect of Obama's vision; I think, perhaps in some ways, his vision may be wrong. Nevertheless, through exploring it all more deeply, in retrospect now, I can't help but see it as of being a noble vision, and one that he attacked with great alacrity and focus. All to say, this document stands out in the midst of ceaseless talking about politics. Now if you have come to see Obama and his people as comic book villains I can't say it will change your mind. But it is but a story. A good one, well told, beautiful, grateful, admiring, amazed and hopeful still. It's a good way to frame the world in context, as the author attempts to portray it, at least from his own eyes, as it is. Finished listening to it in less than a week. There is perhaps no more relevant time to get into this work as now, as, whatever your political views are, chances are you find the other political party (either republican or democrat) as somewhat dangerous and consequential to the country's future. Well then, it turns out, despite how we mythologize and aggrandize the founding fathers as a perfect unified vision of what America is, turns out these divisions have been there from the beginning! The exact same political fault lines, from states rights and the size of federal government, to immigration, and many more. 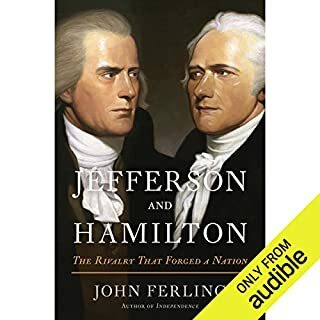 And nowhere is this divide drawn more clearly than by paying close attention to the strong and powerful political divergence between Hamilton and Jefferson. It's simply fascinating to compare our own political [skit] show to the one that was there at the beginning! And to try to decipher how that beginning has informed our political now. There is a need to know this story. The thing is, any other history prior to this seems to be dated, top hats, roaring 20s, dust bowl, depression, and yet, the reality of this story clamours and vibrates right into the frontal cortex of our brains to this day so obtrusively, that with their type writers, uniforms, planes, cars, we can recognize this world as very similar to our own. And, in an age that tries to stand up high and say we are now above the barbarism of the ancient worlds, this still bears us in the face. We have to ask ourselves, how? We recognize that the people that made up the cities and villages of Germany could not have been too different from us. They look like a lot of peoples' grand parents, and they are too. So, this being the fundamental watershed moment of the 20th century, i suggest you do indeed look it straight in the face here, through this fine production, a classic, based on endless reams of firsthand documentation, riveting. Now it is a mammoth, and perhaps you will have to take breaks getting through this (i listened to a book or two in between before finally finishing it). It is heavy subject matter, as intriguing as it remains. The perspective is the German government. The inside world of the beuracracy, politics and war rooms. At the center of course is Hitler. At the center is this insane ideology. And a hurricane sparks to save Germany from poverished times through promises of order and stability. They got those things. There is the genius of Hitler's political maneuvering. He becomes a savior. So much of this story will always of course be beyond understanding. 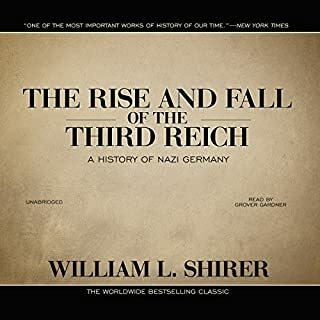 Shirer tells it as it occurred through the remaining documentation and the accounts of the nuhremburg trials. But if nothing else, you as a reader/listener in a way enter into this world. And so from that perspective, you may have as much insight into it as someone who was living there at the time, looking back; though even that, after all is said and done, perhaps isn't worth that much. strength is power. is an approach to the world that will leave you in shame. hitler was a wolf-person. these are among the key insights i took away from the work.